We started this eighth part of our walk around the coast of Britain back in Fobbing, where we finished last week. This week we were again joined by my aunt, Jenny. 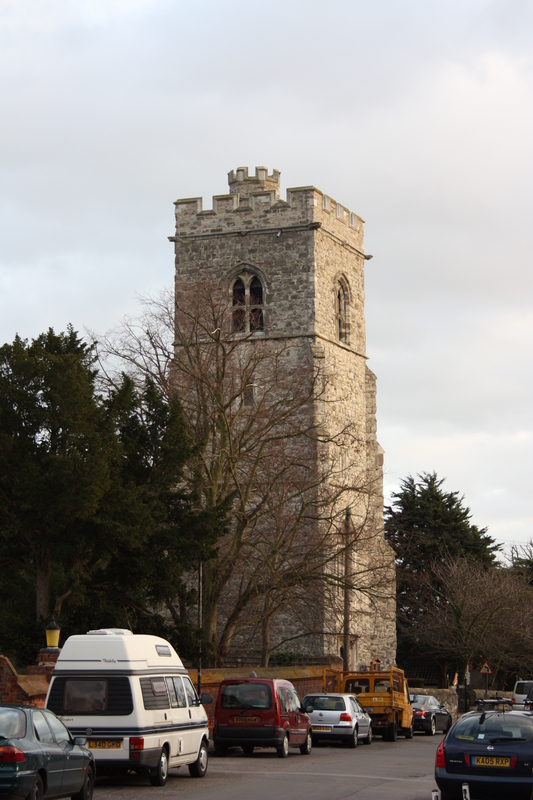 Fobbing is a small village dominated by a large church, St Michael’s, with a tower topped by a beacon. Although this beacon was not alight to guide us in today, it was most certainly used and valued in the past. Smugglers in particular used it to navigate up the Thames and in to the village, for until a dam was built the waters of the Thames flowed right up to the village’s foot. Fobbing’s history has strong links to smuggling, and underneath the church there are many tunnels which were used by smugglers in the 14th Century. The church is not the only building with such passages. The local pub, the White Lion, has a passage which ran to a nearby monastery, part of which still survives today. Fobbing, apparently, means “followers of Fob”. My wife suggested that for today’s walk I should be “Fob”. I told her that would be fine, providing she took command at the next village. She agreed, not realising that we were headed to a village called Mucking. And with that, Fob, Fobette, the two Foblings and Auntie Fob started their walk. Fobbing is a rather quiet village today, yet has quite a history to it, particularly as one of the flashpoints of the Peasant’s Revolt in 1381. At this time funds had to be raised in order to help pay for recent wars against France, and it was decided to do this by way of a poll tax. This was not a new thing; a poll tax had already been levied in 1377. However, in 1381 the tax, which was spread over the entire male population, was a shilling a head, three times its previous level. The tax was a massive burden, particularly on the poor. Originally the plan was to levy the tax in two installments, one in January 1381 and the second that June. However, after the January collection it became clear that there had been evasion on a massive scale. As a result, the government decided to collect the second installment immediately, as well as ordering enquiries into the original evasion. On 30 May 1381, when a man named John Bampton arrived in Fobbing to collect the second installment, the people “…roundly gave him answer that they would have nothing to do with him nor give him one penny…“. He was forced out of the village by an unruly mob, causing the Chief Justice of the Common Pleas, Robert Bealknap, to be sent down to punish the rioters. In the meantime, however, the people of Fobbing had called for support from their neighbours. When Bealknap arrived he too was forced out, this time with bloodshed. As he hurried back to London, rioting broke out in other towns, and soon the entire country was beginning to revolt. Peasants from South Essex and Kent marched on London and met with the king, Richard II. After initially agreeing to the peasants’ demands, Richard II then reneged. Many of the leaders were arrested and executed. Thomas Barker, a local man, had led the villagers of Fobbing. He managed to evade capture for 40 years. However, when he eventually tried to return home to his village he was caught, and then hanged, drawn and quartered. It is perhaps worth considering this punishment in a bit more detail, for I remember when I was a boy I was somewhat appalled to find out what it actually entailed. The first known use of the punishment was in 1281, when William Maurice was handed the sentence for piracy, and it continued until 1790; although the sentence continued to be handed down after that date, it was not carried out. Typically, the punishment was reserved only for men. For reasons of decency, women were treated comparatively well, and only had to suffer being burned alive at the stake! We left Fobbing via a right of way just beyond St Michael’s, and started making our way towards its more significant neighbour, Corringham. Rather than passing through the town, we skirted around its southern edge, passing through the graveyard of St Mary’s, a church with a tower dating back to Norman times, although a spire has since been added. Beyond Corringham we reached the A1014, a dual carriageway linking the Stanford-le-Hope bypass with the Coryton oil refineries to the east. We counted oil tankers travelling to and from Coryton at a rate of approximately one per every two minutes, for the Coryton refineries are a significant force in oil distribution. In 1923 the Corringham Marshes, which at that time included the small village of Kynochtown, were purchased by the Cory brothers, who renamed this village Coryton. A large oil refinery was built, and then sold to the Vacuum Oil Company in 1950. Vacuum decided to reconstruct, re-opening on 31 January 1953. The timing of this could not have been worse, as that evening the Essex coast suffered devastating storms and the highest tide ever recorded. I have described the effect of the 1953 flood on Canvey Island, just to the east, in an earlier post. There, 58 people died. Luckily, there were no casualties in Coryton, although the refinery itself was damaged and had to be repaired. Other companies have joined the area and left it over the years. Today the entire area is run by Petroplus and supplies 20% of the southeast’s fuel. The village of Coryton itself was shut down in 1969 and all buildings demolished by the mid-1970’s. “Coryton” now refers to the whole area. (Postscript, 24 January 2012: two days after this walk Petroplus halted sales from Coryton, and the following day announced it would be filing for insolvency – HERE is the BBC news article). In 1970 a 10,000 ton passenger ship, the Monte Ulia, crashed into Coryton’s refinery jetty, spilling hundreds of tons of oil into the River Thames. This caught fire and began to spread across Holehaven Creek towards an oil tanker offloading on Canvey Island. Luckily, the winds weren’t blowing in that direction. What could have been a disaster on a massive scale was contained and averted. Coryton used to have a footpath around its entire perimeter, however, this was closed in the 1970’s after an IRA bomb was planted there, but failed to go off. The only option for coastal walkers today is to cut inland, as we were doing. It is, I admit, possible to leave Fobbing and head east over fields, arriving at the guarded gates to Coryton, only to go no further. One then has to walk back along the dual carriageway to where we were now. As much as this would technically take us closer to the coast, it wouldn’t take us TO the coast. This blog is called The Coastal Path. We decided not to take in a security huts and some gates, but continue to the coast and our main purpose. Thus, whilst for many weeks we had been walking towards a horizon dominated by the stacks and refinery buildings of Coryton, today we started walking away from them. Crossing the A1014, we continued southwest along a quiet road passing Oak Farm. At the end of this road we turned south, heading down Rainbow Lane, and at last back to the coast. 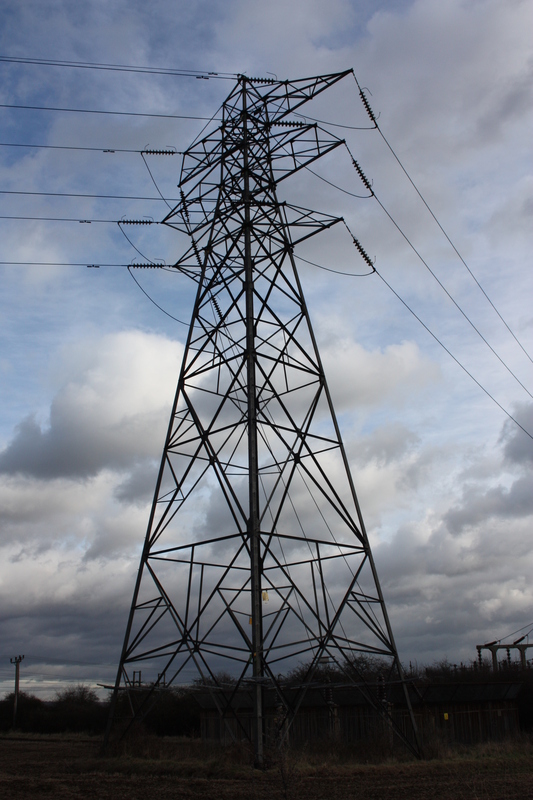 This entire stretch of the walk is dominated by a series of large pylons which stood over us as we followed our route. Although we had reached the coast again, our coastal path was short-lived. After only half a mile of so of walking alongside the Mucking Flats, the path turns inland along Mucking Creek. Interestingly, our path did not seem to take us along the right of way shown on the map. On getting home we looked at Google Earth which shows a series of four fields in between the route we took and Mucking Flats. 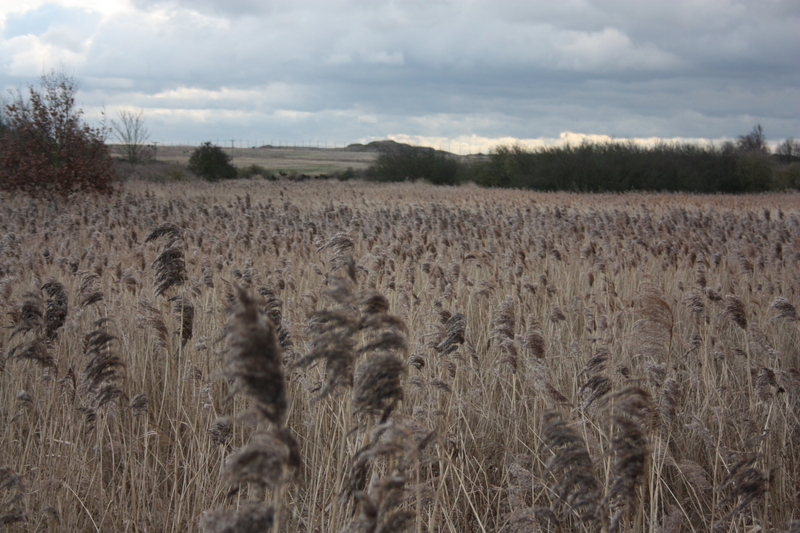 However, during our walk this entire area seemed flooded and given back to the sea, as shown by the photograph below. In the medium distance, two little spits of land poked out into the flooded area, and it is clear that these are the remains of what is the path shown on the map and indeed on Google Earth. Perhaps the area is more accessible at low tide. Perhaps the fields have been purposefully flooded. Our path inland headed into The Stanford Marshes Nature Reserve. This is mostly a series of fenced off angling lakes which appeared to us to be quite popular. 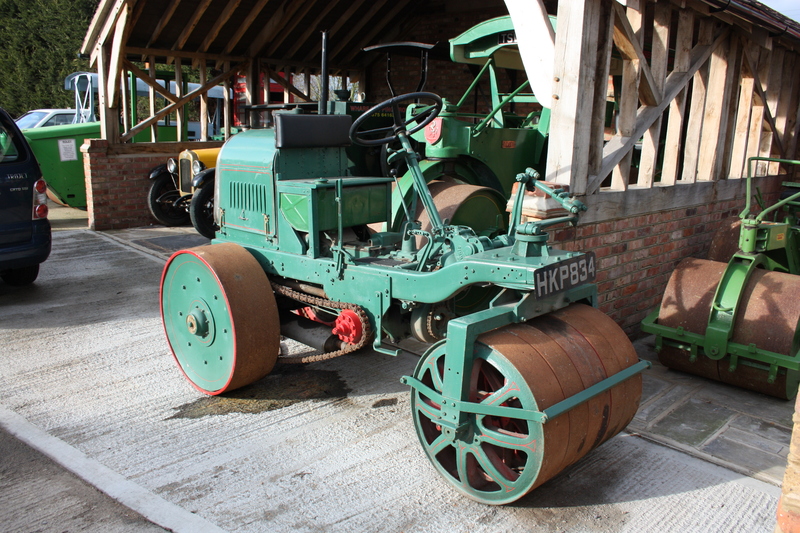 In the heart of the area is a small row of cottages and a timber yard, in front of which is a well-kept refurbished barn with a number of antiquated steam engines and cars in it. We carried on, turning west out of the angling lakes, along a small track with marshes of reeds to either side, and into the village of Mucking. Mucking, it has to be said, is a tiny village. 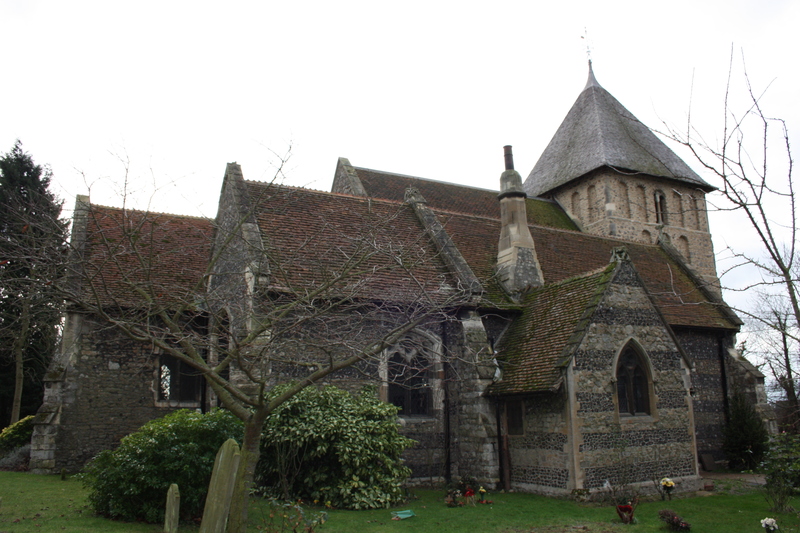 It dates back to Anglo-Saxon times (the name Mucking meaning “Mucca’s People), and has a medieval church. In Victorian times it even had shops and a pub, but it now seems to consist of a small farm and a couple of houses. The church still stands, but has apparently been converted to a private residence. 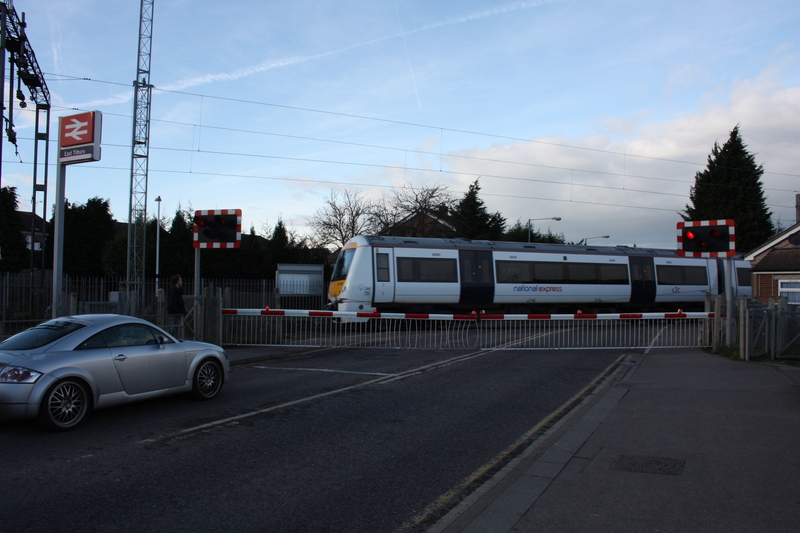 Before we knew it, we were passing over a level crossing out of the village. After walking alongside the railway line around the edge of a field, we picked up Walton’s Hall Road, a country road with no pavements or safe walking areas, along which cars travel at some speed. After a rather exciting three quarters of a mile, during which only one car showed any sign of losing control as it braked to avoid us, we managed to turn off into a field, and take a footpath into Linton. We walked down to the southern outskirts, where the village joins East Tilbury, ending our walk at East Tilbury station. On our next walk we will at last be able to get back to the coast, heading off to Tilbury where we will be able to take the Tilbury to Gravesend Ferry, leaving Essex and starting Kent. 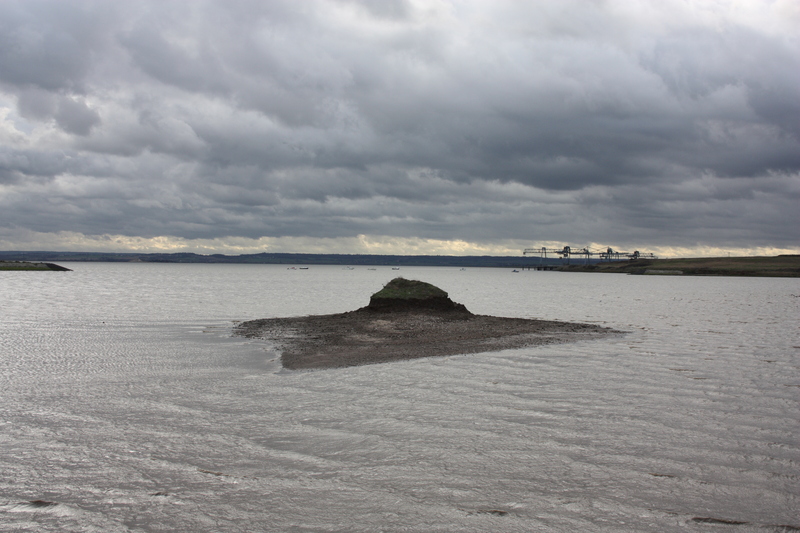 This entry was posted in Essex and tagged coast, East Tilbury, Essex, Fobbing, Mucking, Peasant's Revolt, travel, walking. Bookmark the permalink. I found your article extremely interesting and note that your next walk will be to Tilbury and across to Gravsend. If your group would be interested in viewing the London Cruise Terminal, an historic Grade II* listed building of significant heritage on the river, I shall be pleased to arrange this, assuming your walk falls on a convenient date. If this is of interest to you, perhaps you could contact me. Lynda Viccars Cruise Terminal & Community Liaison Manager, Port of Tilbury. Tel: 01375 852200.